1. 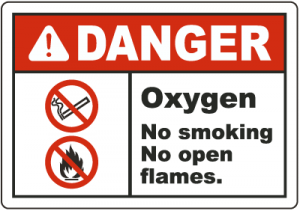 No Smoking: Never smoke while using your portable oxygen concentrator, home oxygen concentrator, or oxygen tanks and do not allow anyone to smoke near you while you are using your oxygen. Because this is medical grade oxygen, it's highly flammable and has been known to ignite from just the breath of someone who's just had oxygen therapy. Posting a "no-smoking" sign on your front door will remind guests not to light up. 2. Avoid Open Flames: Stay clear of open flames: even something as harmless as a scented candle or gas stove top, when lit, can pose a hazard around oxygen. 3. Avoid Wearing Loose Fitting Clothes: Don't wear loose clothing or long sleeves when working around the stove. This isn't just a good idea around oxygen; it's a safety measure in any kitchen, for young and old alike. 4. Avoid Aerosol Products: Be careful around aerosol products, such as air fresheners, body or hair spray, as they're highly flammable. 5. Avoid Flammable Liquids: Keep away from flammable liquids, including gasoline while fueling your vehicle or lighter fluid for the barbeque. Even if you're outside using your portable unit, be mindful of oxygen safety. 6. Properly Store and Secure Oxygen System: Keeping your portable unit secure, whether snug in its holder or taking it on the road in the car, will prevent it from damage and potential injury. Dropping a portable oxygen concentrator can damage the machine and it could possibly void your warranty. Dropping an oxygen tank or having it roll around in the backseat can damage the valve, causing it to leak oxygen or creating the possibility of a projectile. 7. Inform Your Power Company: Let your local power company know that you're using oxygen equipment. In the event of a power outage, they will make your home a priority, and you could qualify for a discounted rate due to medical necessity. 8. Give Your Concentrator Enough Space: In the home, locate your oxygen concentrator away from walls or enclosed areas. Your unit draws in room air, sends it through a filtration process, and concentrates it, as its name implies, so it needs a continuous source to work optimally. Also, it can pose a fire hazard in a confined space, so it certainly doesn't need to be in the closet. 9. Avoid Tripping Hazards: Use the shortest length of tubing possible to prevent fall hazards. Look out for door sills and area rugs, which can also pose tripping problems. 10. Take Care of Oxygen Equipment: Read the instruction manual for your unit and do any recommended maintenance, such as cleaning or replacing filters. Familiarize yourself with any error codes or alarms before they go off so you have an idea of what you may need to troubleshoot.